A stalker who attacked a former supermodel and Bond girl in Austria had been arrested twice for breaking into her Cardiff home. Best-selling author and UN campaigner Waris Dirie, 40, was attacked by her former handyman Paulo Augusto, 26, a week after she had moved to Vienna with her seven-year-old son. South Wales Police have said that Augusto was arrested twice in one month for breaking into Ms Dirie's home, in the Penylan area of Cardiff. A police officer said: "On one occasion he even answered her phone when she called home from abroad to pick up her messages. "She has been through hell and back at the hands of this man. He is a classic stalker." Augusto, a Portuguese national, is in custody in Vienna following the attack this week. Vienna police spokesman Harald Hofmayer said: "Our main concern right now is to get this man extradited and banned from our country for good. "I am afraid he will come back and hurt Miss Dirie if he escapes jail and isn't ordered back to Portugal. He is very dangerous. "She had a cut above her left eye where he kneeled on her chest and elbowed her in the face. "The neighbours called the police. They could hear him shouting I love you and her saying she didn't love him. "He went back twice, she was very frightened and he was arrested and questioned for two hours by police." During police interviews Augusto said Ms Dirie - a campaigner against female circumcision - was his common-law wife and that they had been having a relationship for six months. But Augusto, originally from Lisbon, only met Ms Dirie last year when he came to visit his brother in the Welsh capital. Painter and decorator Luis Augusto, 29, was working on Ms Dirie's home and hired his brother to do odd jobs. Mr Hofmeyer added: "His brother has worked for Miss Dirie but she has never been his lover - he is clearly obsessed. "He obviously fell for her and since then has been convinced that she is made for him. "He has broken into her home before, taking with him a number of personal items including clothes." South Wales Police confirmed they had arrested Paulo Augusto twice for burglary at the model's home last year. In September, the case was discontinued by the court and a month later he was found not guilty. Somalia-born Ms Dirie starred in the 1987 Bond film, The Living Daylights, and now works for the United Nations. She was one of 12 children born to desert nomads in Somalia and escaped being sold into marriage for five camels at the age of 13 and ran away to London. She taught herself to read and write and five years later got her break as a model when a photographer spotted her in McDonalds. Ms Dirie has alongside some of the world's most famous supermodels, including Naomi Campbell and Claudia Schiffer. 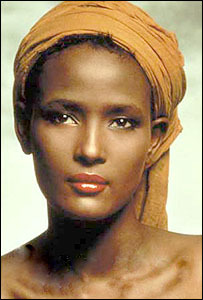 In 1997, she left modelling to work for the United Nations, campaigning for women's rights in Somalia. Her first book, Desert Flower, was published in 1998 and became a worldwide best seller. It tells of her escape through the Somalian desert to escape marriage to a 60-year-old stranger. The sequel, Desert Dawn, tells of her return to Somalia.